In this article we will take a closer look at the ‘Relative Strength Index’ indicator (RSI). This is one of the most popular indicators to identify buying and selling opportunities. However, this indicator alone is not enough to base your investment decisions on! We will go into this in more detail later on and it will become clear why this is the case…. Another important point to make is that the RSI indicator is not the same as the term ‘Relative Strength’. What’s more, the two terms have absolutely nothing to do with each other. The RSI indicator, as the term suggests, is a purely technical indicator, in this case a momentum oscillator that indicates when a stock has been oversold or overbought. ‘Relative Strength’ looks at the relationship between two companies/sectors or even markets, comparing the price between the two, the higher the figure, the stronger the company will be in relation to the competitor, sector or index. The horizontal axis of the RSI indicator shows the time and the vertical axis has a value from 0 to 100. Above 50 the technical trend is positive, below 50 it is negative. The RSI indicator measures the speed and direction of a movement. In this article we won’t go deeper into the exact formula that is used to calculate the RSI, but we will take a look at the basic rules. The general rule is that when the RSI value is above 70, one speaks of an ‘oversold’ signal, which means that the price has already risen quite sharply in a relatively limited period of time and the chance of a (temporary) decrease increases. The reverse situation occurs when the value of the indicator falls below the level ’30′, resulting in an ‘oversold’ signal. The price of the share then fell quite sharply and the chance of a (temporary) increasing counter-reaction increases. 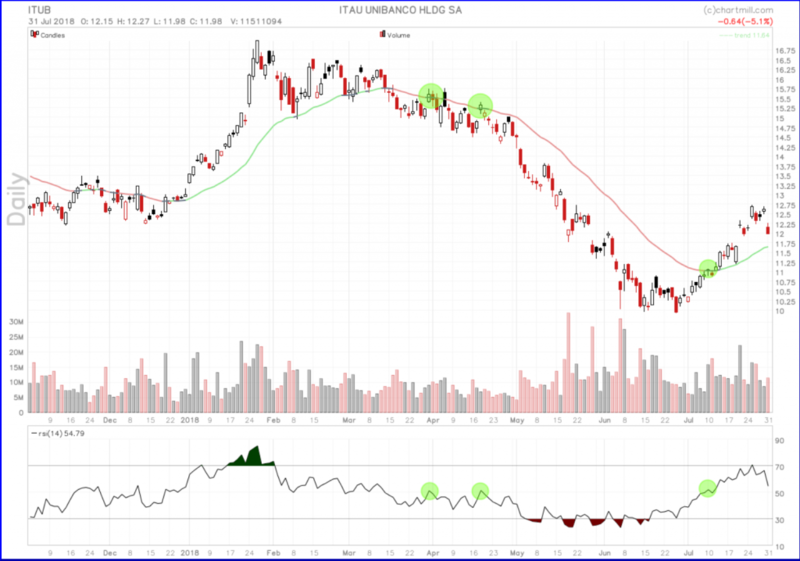 The red circles show the moments when the RSI generates sell signals, the green ones show the possible buy signals. Anyone who bought shares in a green circle and sold them in a red circle has made a very nice series of profit! In addition, the indicator can also be used as a trend indicator. With an RSI value > 50, the trend is positive, but if the value is < 50, the general technical trend of the share is negative. Anyone who went short because the RSI indicator indicated a sell signal will have had little pleasure in doing so! It is obvious that in the example above, the RSI does not give good signals when stocks are showing a very strong trend. In the event of a strong upward trend, sell signals must be handled very carefully; in the event of a sharp downward trend, you cannot simply buy when a buy signal occurs! Luckily, there are – depending on the direction of the trend – specific ways to use the RSI in such strong trending markets. Part II: 3 different ways to use the RSI indicator successfully! 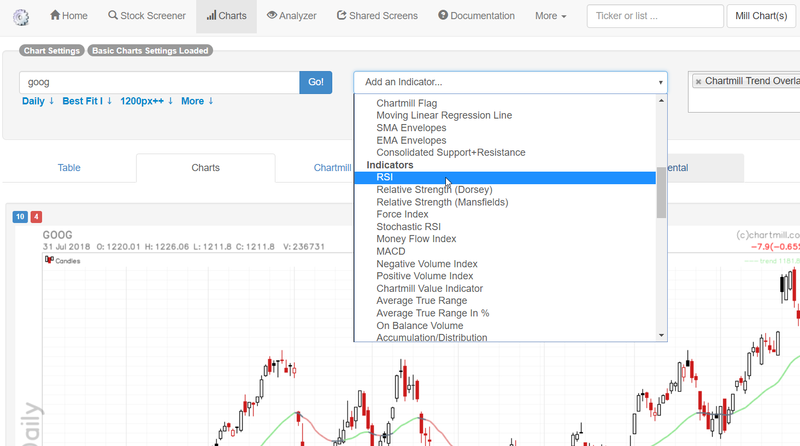 Now we will show you three different ways in which the RSI indicator can be used in your personal trading strategy. The price is located in a sideways-channel (consolidation zone). In a sideways price channel, we already saw that the classic buying and selling moments of the RSI indicator (buying if <30 and selling if >70) are relatively reliable. The share price fluctuates roughly between $11.50 and $7 in a wide lateral price channel. The price falls or rises every time one of the two limits is reached. In this case, the RSI displays accurate signals. In a stock with a clear upward trend, the classical use of the RSI indicator is much less successful. The sharp upward trend on the graph below is immediately noticeable to the naked eye and is also indicated by the ChartMill Trend Indicator (green line in the price chart). As long as the trend continues to increase, it is advisable to simply ignore the sell signals displayed by the RSI indicator. In such cases, you can try to pick up the stock in the event of a temporary fall in the upward trend. And luckily you can also use the RSI for that purpose. In the chart below we show exactly the same chart but the sales signals were ignored and we have indicated the moments when the RSI dropped below the 50-level. Buying when the RSI falls below 50 in an upward trend gives very good results and allows you to increase positions within one stock. As with the upward trend, the RSI can also be used to short the stock in a sharply downward trend if the price of the stock temporarily recovers. 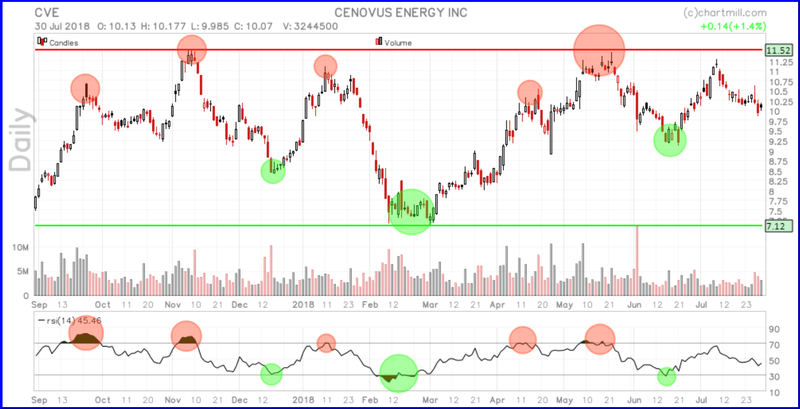 In the chart below we have indicated the points where the ChartMill Trend indicator shows a downward trend (red line) with an occasional price upturn where the trend indicator becomes neutral (grey color) but never positive (green color). At those moments in the graph, the RSI indicator showed a sell signal as the value of the RSI exceeded 50. Only the latter signal was not correct and would have resulted in a small loss (which, however, was more than offset by the previous sell signals). Moreover, there were other indications on the chart below that suggested that there might have been a real reversal of the trend even before the last RSI sales signal. It should be noted that in addition to the classic RSI indicator, a dynamic RSI indicator is also available on the Chartmill platform. Through this link you can read more about it. 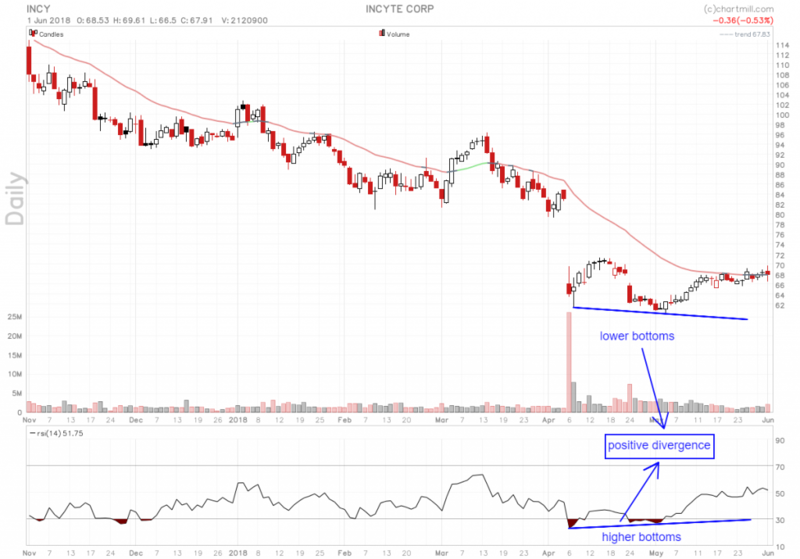 How to use RSI divergence signals to discover new price trends in an early stage. Here we will continue with a last technique that allows you to use the RSI. In doing so, we use divergences between the RSI indicator and the price chart of the stock we want to trade. This is a relatively aggressive application of the RSI, which allows trend changes to be detected at an early stage. Of course, even in this case, the degree of success will depend to a large extent on the way in which the investor deals with risk! Divergence means that there is a difference between the price evolution on the chart and the movement of the RSI indicator. A distinction is made between positive and negative divergence. There is a positive divergence if the price chart still shows lower bottoms while the opposite occurs in the RSI chart line. This is a sign that the strength and momentum of the falling price movement is decreasing – at least temporarily – and thus increasing the likelihood of an interim price upturn. Negative divergence occurs when lower tops are visible in the RSI indicator while the price is still going higher. This indicates that the strength and momentum of the rise is decreasing – at least temporarily – and that the chance of an (interim) price recovery is possible. The graph above indeed shows that shortly after the last top the price is falling quite rapidly and that the RSI therefore falls below the 50-level. 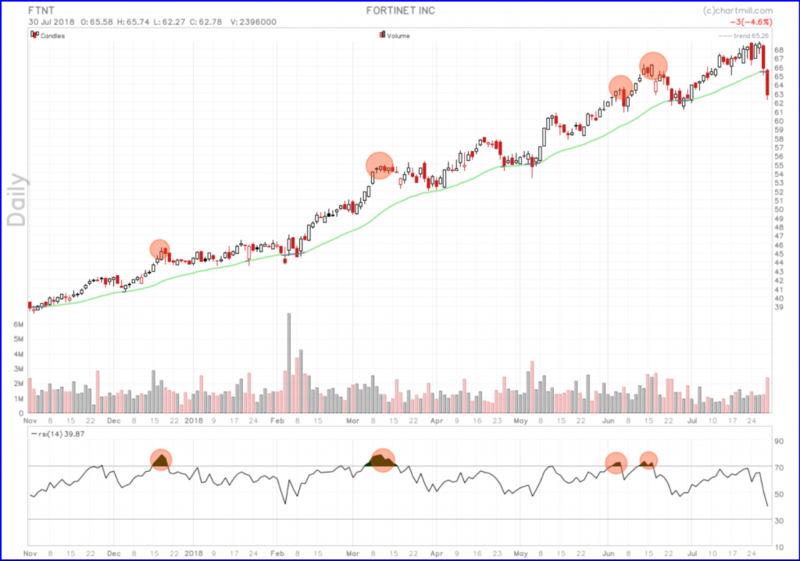 As this is still a rising trend, a situation thus arises (RSI indicator lower than 50 in ascending price trend) where one can decide to go long again after the second last white candle, speculating on a continuation of the existing long-term trend as explained in the previous article. It is therefore by no means certain that the long-term trend will effectively reverse solely on the basis of an RSI divergence signal. The signals certainly offer early entry opportunities if the trend effectively reverses. 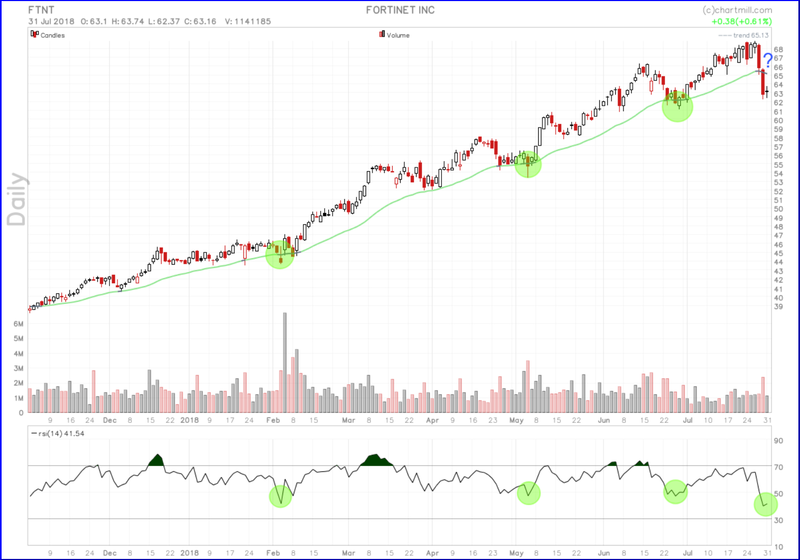 If, for example, you have other (fundamental) information at your disposal besides the divergence signal, as a result of which you are more inclined to assume a new long-term downward trend, you could, for example, choose to maintain the initial short position but bring the stoploss to break-even as soon as the RSI indicator rises back after it has been below 50-level (as is the case above in the graph). 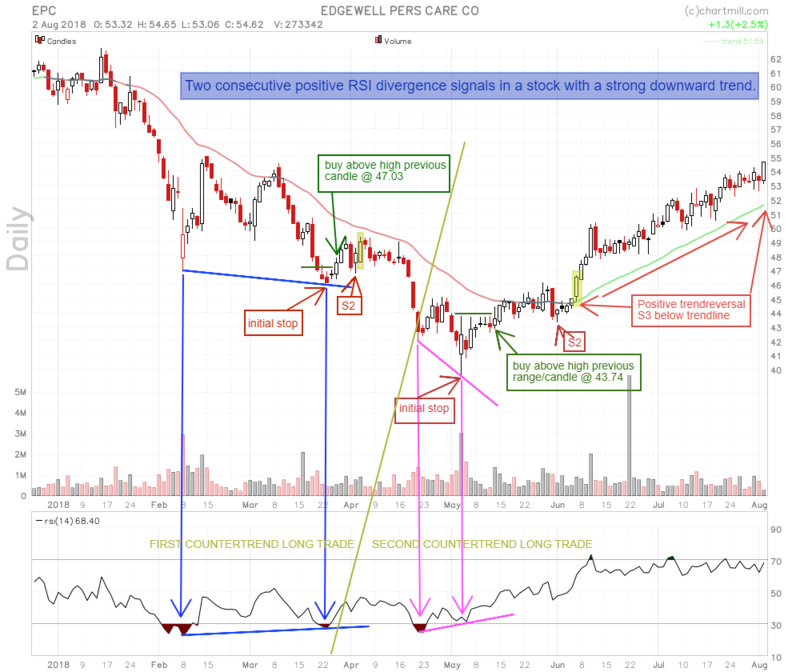 The chart above shows the stock of Edgewell Personal Care (ticker: EPC). Towards the end of January 2018, the share price fell very rapidly. 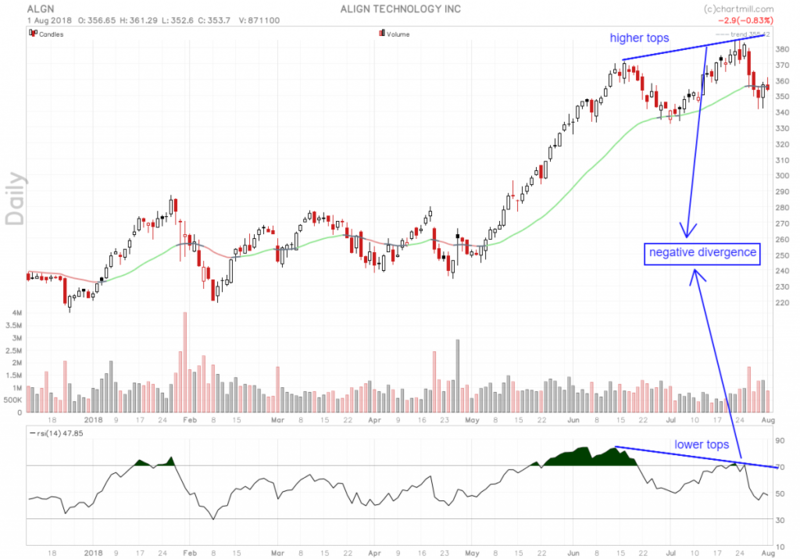 During this downward trend, we see two positive RSI divergence signals. The first signal is indicated by the blue arrows, the price makes a second lower bottom while the second bottom in the RSI is higher. A long position is taken with a short stop below the current bottom price. The position evolves in the right direction at first and after the white candle (indicated in yellow) the stop could already be slightly raised. However, the counter trend does not continue and the position is stopped with a very minimal loss. The second signal is even more powerful (purple arrows). Once again, a long position was taken during the downward trend. Initially the price remains at the level of 45$ for a while but eventually we get a breakout above the side range (white candle indicated in yellow) and we can move the stop to S2. The trend is effectively reversed from negative to positive and the ChartMill Trend indicator turns green. From then on, the stop will be added to the trend line, the long trade is still running and already shows a solid profit. RSI divergence signals are useful for those who focus primarily on counter-trend strategies. They enable investors to identify changes in trends at a very early stage. However, it remains important to realize that in many cases the counter-reaction to the existing trend will be short-lived. That is why they are perhaps better suited to those who like to act a little more aggressively in the very short term.